icacls systax for recursively adding permissions for Administrators to a folder without altering existing permissions? would add Full Access to the "Domain Admins" group to the "root folder" and every folder within. If you add ":r" after Grant then the permissions would be replaced instead of being added. xcopy /s /y "C:\inetpub\wwwroot\Sites\Site1\*. *" "D:\Sites\Site1\"
xcopy /S /Q /Y /F    "C:\inetpub\wwwroot\Sites\Site1" "D:\Sites\Site1"
xcopy /S /I /Q /Y /F "C:\inetpub\wwwroot\Sites\Site1" "D:\Sites\Site2"
/E - Copies folders and subfolders, including empty ones. /H - Copies hidden and system files also. /K - Copies attributes. Typically, Xcopy resets read-only attributes. /O - Copies file ownership and ACL information. /X - Copies file audit settings (implies /O). /X - Copies file audit settings and system access control list (SACL) information (implies /o). /O - Copies file ownership and discretionary access control list (DACL) information. /X – Copies file audit settings and file ownership and ACL information. /H – Copies hidden and system files. /E – Copies directories and subdirectories, including empty ones. /V – Verifies each new file. /D – Copies files changed on or after the specified date (D:m-d-y).If no date is given, copies only those files whose source time is newer than the destination time. Typically, each of these commands would be used with an object type that you are asking AppCmd.exe to perform the requested function on. AppCmd is the built-in CLI tool for configuring and managing IIS. You can use it to create sites and app pools, link virtual directories, and edit configurations. Let’s look at a few things it can do. First of all, add %systemroot%\system32\inetsrv\ to your path so that you can run appcmd from a command prompt in any location. Now list apps again. You won’t see the new site you’ve added because it isn’t considered an app. If you go to the GUI and refresh your sites, you’ll see the new site there, but it’ll be broken. We need to add an app using appcmd. appcmd add app /site.name:"Dummy Site" /path:"/"
This will only add the app to the site at the root. It will create an app named “Dummy Site/”. We still need to link the app to a virtual directory then point that to a physical path. appcmd add vdir /app.name:"Dummy Site/" path:"/"
appcmd set vdir "Dummy Site/" /physicalPath:"c:\inetpub\wwwroot"
This is the verbose way to use appcmd to create an IIS site. There’s an easier way. appcmd add site /name:"Dummy Site" /id:10 /bindings:http/*:81: /physicalPath:"c:\inetpub\wwwroot"
But knowing the other commands gives you a better idea of how an IIS app really works under the hood. In the past, I’ve used appcmd in the post-build script of ASP.NET proj files to ensure the site was set up locally on new developer machines. 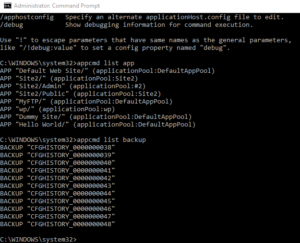 You can also do a backup and restore of IIS config using appcmd. Create a subfolder for each site. Deploy versions to subfolders under each of those. Use appcmd to update the site to use the new folder. appcmd set vdir "Dummy Site/" /physicalPath:"c:\Sites\HelloWorld\1.0.1"
appcmd set vdir "Dummy Site/" /physicalPath:"c:\Sites\HelloWorld\1.0.0"
Here’s a great guide from Microsoft with more information on using AppCmd. “iisreset” is a separate executable used to stop, start, restart IIS or event to reboot the computer (/REBOOT). You can pass it a “computername” parameter to have it control IIS on another computer. You will need to run this as admin. Many developers and system admins like to use this after a deployment, and that’s not a bad idea either!